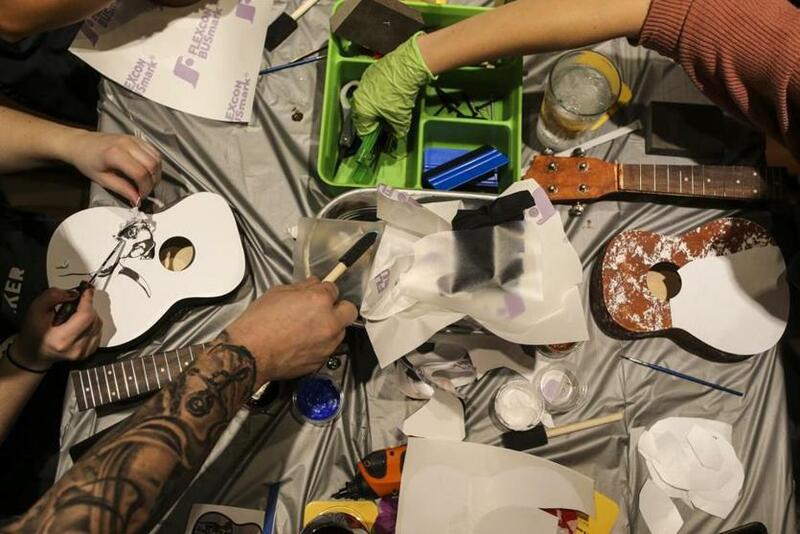 Thursday at Bertucci’s in Kendall Square was ukulele-building night, an event put on by Somerville-based Yaymakers. The participants included Rajesh Sridhar (left) and Jed Tranate. CAMBRIDGE — David Daykin raised his arms over his head like an aerobics instructor: “Give me a Y! Give me an A! 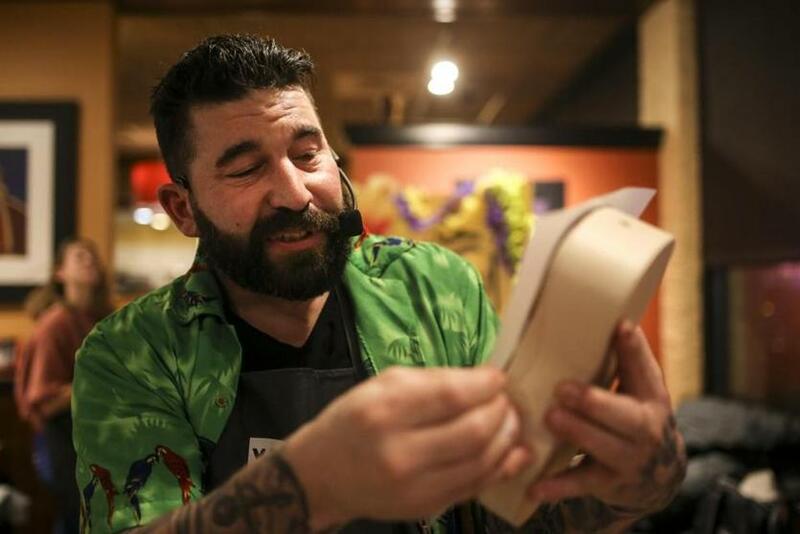 Give a Y!” he shouted into his headset microphone, exhorting two dozen strangers gathered at a Kendall Square Bertucci’s to get revved up for an evening of ukulele-making. There was a time when gathering a gaggle of friends to sip wine and paint oversaturated landscapes felt novel. But now, Paint Nite, the Somerville company that has allowed millions of would-be artists to channel their inner Monet while sipping chardonnay, is upping the ante. A pioneer in the burgeoning retail sector that focuses on selling experiences rather than stuff, Paint Nite is rebranding itself as Yaymakers, and offering a broader array of social craftmaking nights. The new name is meant to help the brand stand out from a sea of sip-and-paint competitors, said Dan Hermann, Yaymakers’s president, and to bring “making” to a wider audience. Over the past year, the company has added candle crafting, sock puppet-making, and cookie decorating nights. It has also rolled out drone-building and design-a-sign events to attract more men and removed the 21+ requirement on some sessions in an attempt to lure families. And it has invested in hundreds of ukulele kits. 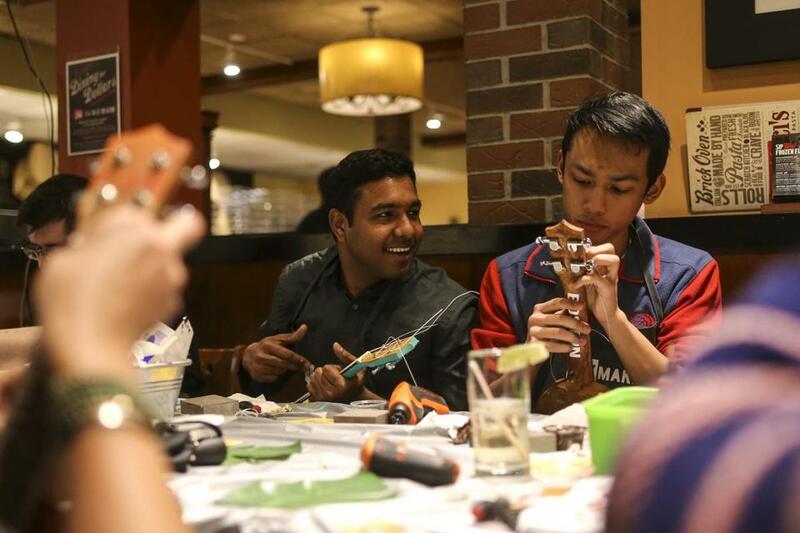 Attendees worked diligently at personalizing their ukuleles during a ukulele-building event put on by Yaymaker at Bertucci's Thursday night. “We are trying to create ways to get people connected,” said Hermann, who cofounded the company with Sean McGrail. In 2012, the two men, both bar trivia buffs, attended a friend’s birthday party that combined painting and drinking and discovered they liked doing something creative while imbibing and hanging out. Their first Paint Nite at Clerys bar drew a crowd of 50. Channeling Bob Ross in a bar caught on fast, and the founders soon began licensing the concept nationally. The company now employs 235 full-time staffers in Somerville and 1,500 local partners in cities across the country who coordinate 6,000 events a month, pairing artists with restaurants and bars that are seeking foot traffic on slow nights. In 2016, they landed as number two on Inc.’s list of fastest-growing private companies, with annual revenue of $55 million. Some of their most popular paintings, like “Under the Red Tree,” have been painted at over 29,000 events. Since its launch, the company has benefited from a shift in consumer demand from objects to experiences, particularly as the spending power of millennials and Gen Z has grown. Joe Pine, coauthor of “The Experience Economy,” called the name change a smart move. “They’re actually turning from a single experience offering to becoming an experience platform,” he said. He noted that Airbnb, spotting a similar opportunity, recently began enabling its customers to buy experiences in addition to booking rooms, such as meditating with a Shaman in Bali or going on overnight snow cave tours in British Columbia. The company books over 1.5 million experiences a year, according to its chief executive, Brian Chesky. While baby boomers helped stoke the demand for experiences — Pine cites the opening of Disneyland in 1955 as the official start of the experience economy — millennials are fueling the blaze. “They prefer instant gratification from entertainment and are attracted to media, gaming, and experiences that are shared socially,” the report said. 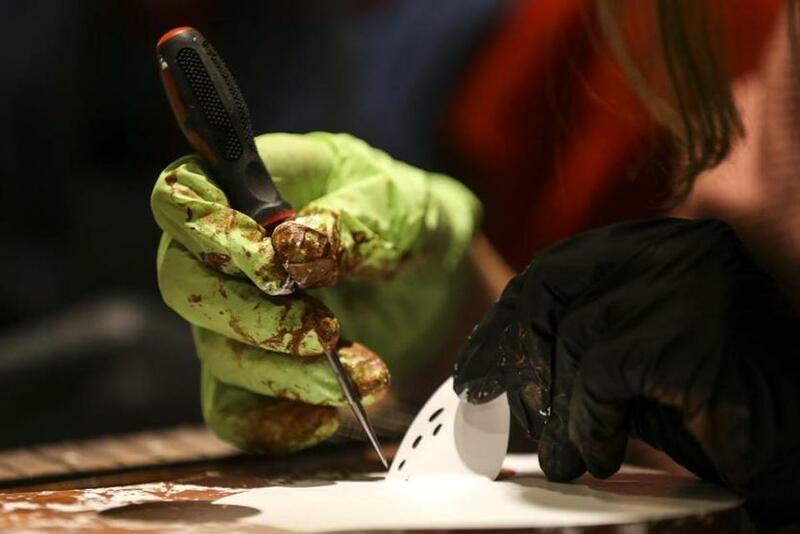 Attendees work diligently at personalizing their ukuleles during a ukulele-building event put on by Yaymaker at Bertucci's Thursday night. The original notion of a Paint Nite — painting the same landscape painting as everyone else in the bar — can feel limiting, creatively speaking, for that demographic. “Painting a canvas is fun, but you have to follow what they say,” said Amanda Bonnette-Kim, 24, who painstakingly detailed her turquoise ukulele with pink roses. Plus, she said, the artwork doesn’t always turn out as refined as you’d like. “My boyfriend painted a tree, but it looked like a ladder,” she said. As Bonnette-Kim worked on her uke, the event’s cohost, Rachel Marshall, snapped photos and encouraged people to share their own, using the hashtag #makeyayallday. David Krauter, who joined the company as chief executive in 2017, said participants want to be distracted from their devices, but the most successful events also have photo-worthy moments that will play well on social media. Hence the drones and ukuleles. Pine said the best brick-and-mortar retailers — including the restaurants and bars that host Yaymakers and their ilk — are also immersed in the experience economy, looking for new ways to entertain customers to help fight off the encroachment of online buying. “There’s a bifurcation going on in retail, whether you provide time well saved or time well spent,” he said. For 23-year-old Caitlin Roberts, the ukulele event was an outing for the arts and crafts club at Jobcase, where she works. Building your own instrument was more hands-on and “a lot easier than painting a canvas,” said Roberts, who has participated in Paint Nite events in the past. David Daykin demonstrates part of the ukelele building process during a ukulele-building event put on by Yaymaker at Bertucci's Thursday night. After three hours of assembly, the ukuleles were ready — in theory, at least. Daykin, sporting a Hawaiian shirt, began strumming each string in an attempt to get the entire room in tune. Suffice it to say this was less than successful. But nobody seemed to mind. It was, after all, their first-ever handmade ukulele.